Smart contracts for the music industry. During the conference I gave a talk on my project called Mycelia and the impact blockchain technology can have on music. 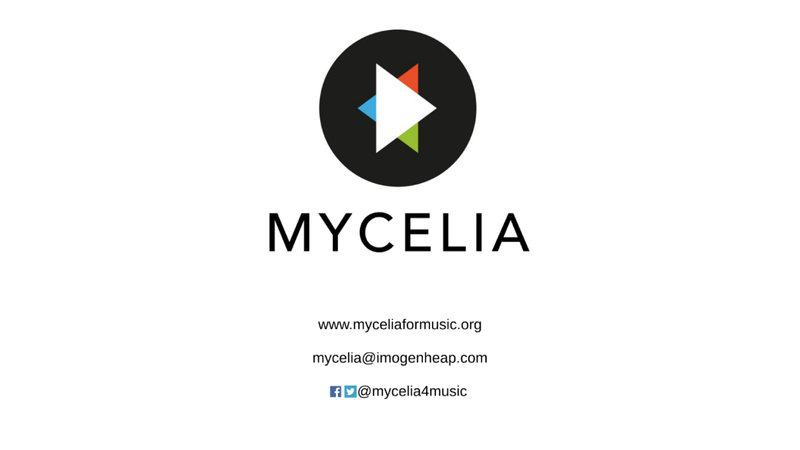 At Mycelia we aim to empower a fair and sustainable music industry ecosystem by ensuring that all involved in the music making process are paid and acknowledged fully. 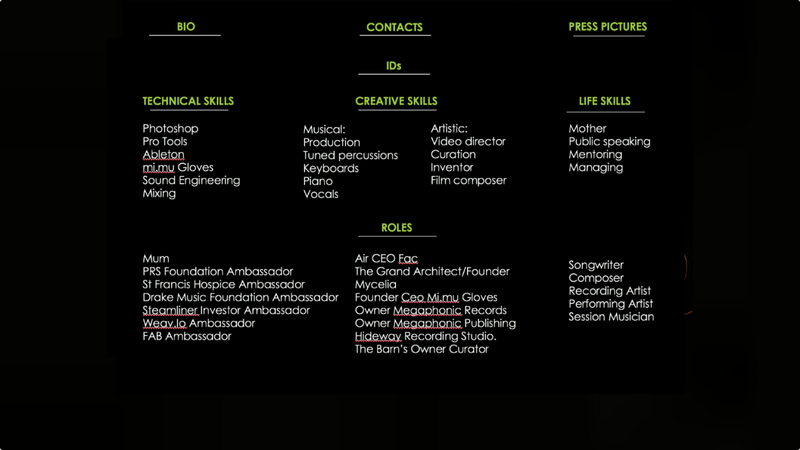 Creatives in the music industry are the first to put in any work and the last to ever see any profit. There is very little information available about how their royalty payments are calculated, and they don’t get access to valuable aggregate data about how and where people are listening to their music. 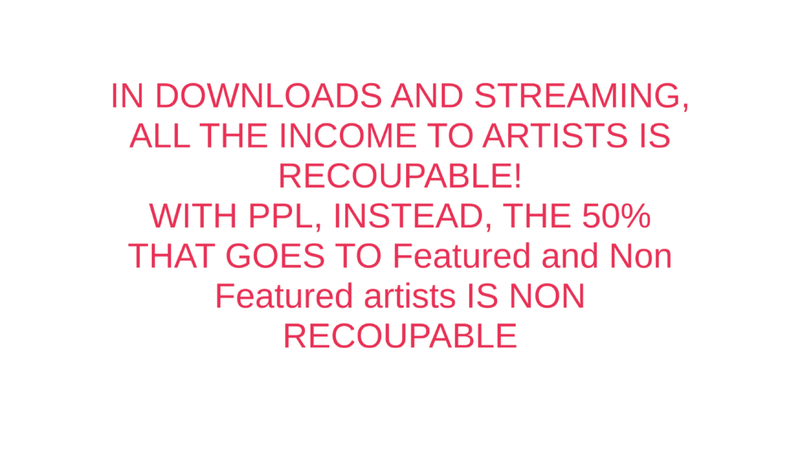 This is partly caused by the lack of a verified global registry of music creatives and their works. All past attempts to create one have failed. Now blockchain technology has the potential to allow for a seamless and equitable experience for creatives and those listening to music. Imagine: listening to a song automatically triggers an agreement for everyone involved in the creative process of a song with those who choose to interact with it — fans, streaming services, or film crews. 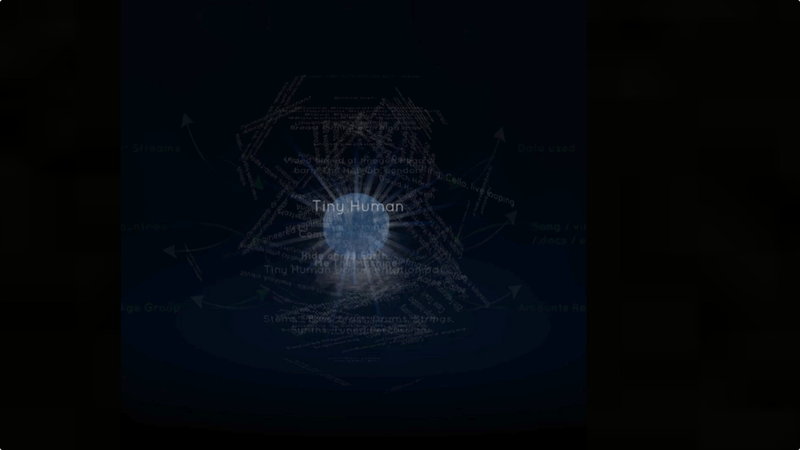 I released the song Tiny Human to explore the potential of blockchain technology and music distribution. 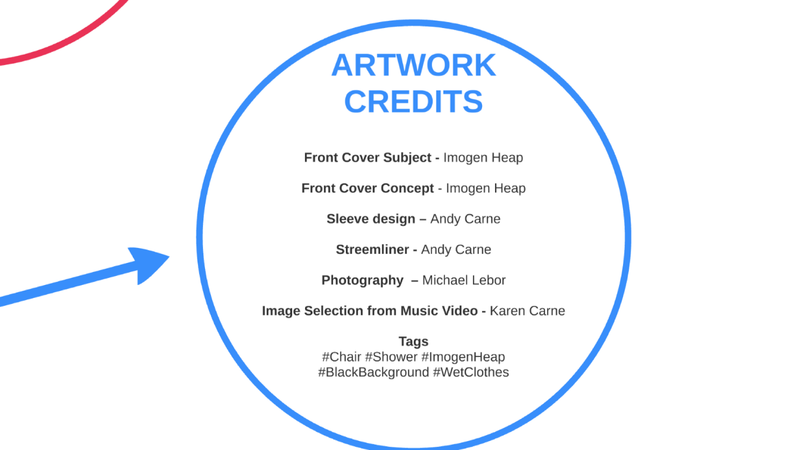 It was the first song to automatically distribute payments via a smart contract to all creatives involved in the making and recording of the song. 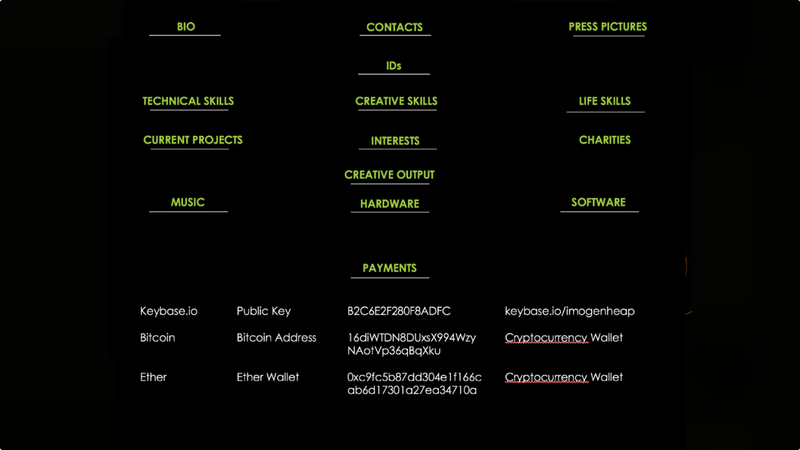 This was one of the first steps forward in the intersection between music distribution and blockchain. Now is the perfect time for the music industry to look forward and find more ways through blockchain technology and the Internet of Agreements to improve music distribution — for the sake of creatives and the industry’s long-term success. Hello, good afternoon — I’m excited to be here, to talk about music on the blockchain! About three years ago I heard the word “blockchain” and it pretty much changed my life, along with having a baby at the same time. It made me rethink in my mind how I would rather do business in the music industry, having been in it for 20 years before that point, and being frustrated for many reasons, but also encouraged for many other reasons, because there are lots of good people working in this industry. 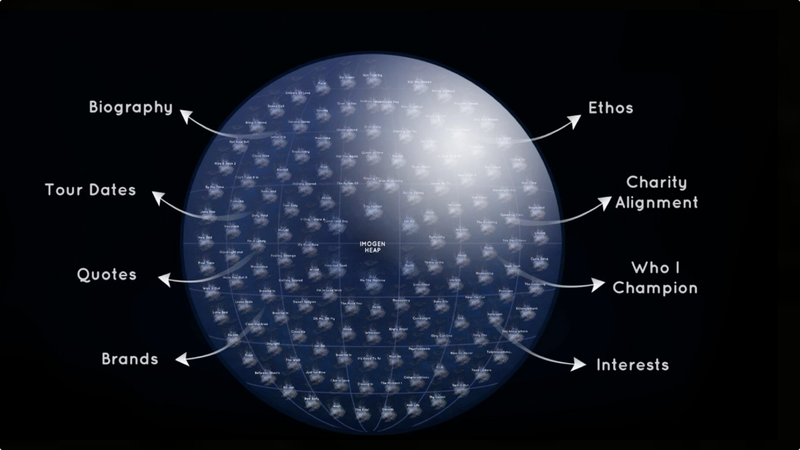 I’m going to talk about this thing called Mycelia, which is the vision of a future music ecosystem based around songs and a creative database, inspired by blockchain technology, and how it made me rethink to do things in a more sustainable way and a flourishing way, hopefully. So, here we go. 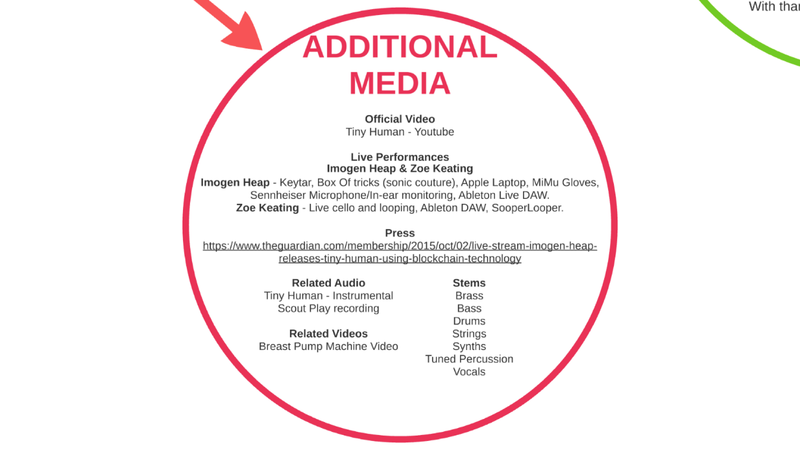 This is like a Play button, it’s like an augmented Play button, because I feel like blockchain is augmenting organisations, companies, rethinking things, rather than… a lot of people use the word “disruption”, and that scares the music industry; I think “augmentation” is nicer. 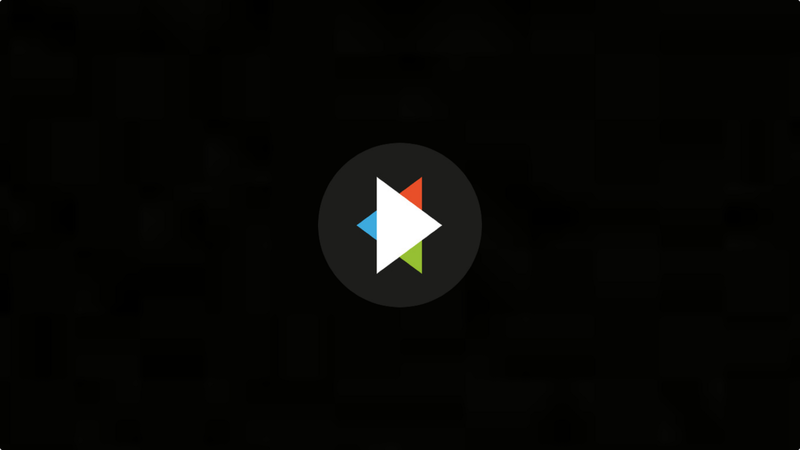 It’s like an augmented Play button, and this would be able to tell you that when you heard a song, maybe you might be able to know who wrote all the words, whether they’re being paid fairly, or maybe where some of the proceeds might be going, like going to a disaster relief fund, because you could do that. There’s a song, it’s called Tiny Human, and I wrote this just after I’ve given birth to my first child. All you can see really is just my name, the song title, when it’s released and all that stuff. But, here’s all the information I would love to share — look at all this lovely data! Nobody gets to see any of this, and these, I think, is what’s going to enable the flourishing of the music industry, having access to this data to enable companies to think imaginatively and build services that people would like. It’s just simply having the right lyrics attached to a song. 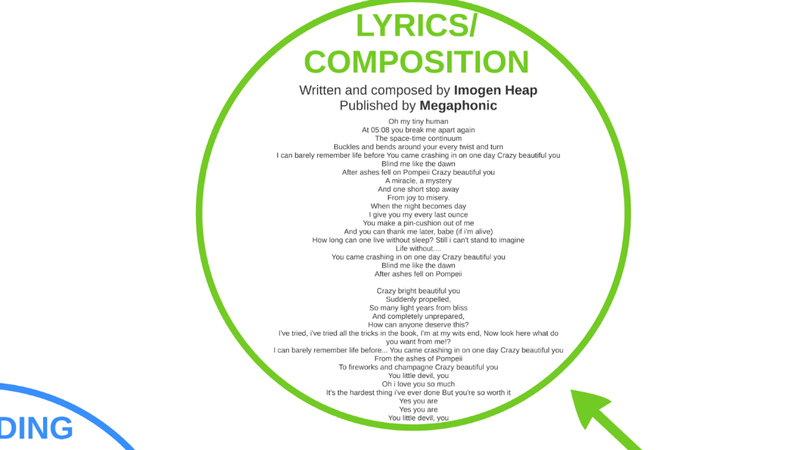 There’s nowhere that you can find verified lyrics in one place; sometimes songs are written by 10 people, and nobody gets to know who they are. 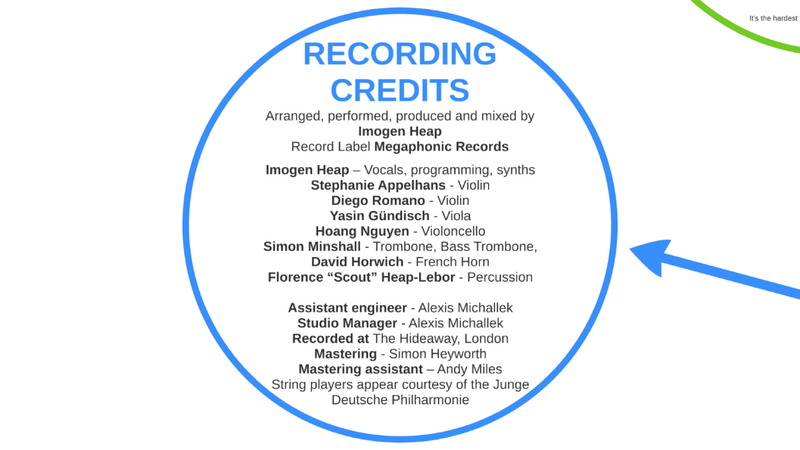 Recording credits, relatively simple ones: there’s me, I recorded it at my studio, and these people came in to play instruments for me. I used the same mastering engineer that I’ve used for 10 years, except nobody knows this, because they don’t get see any of the credits, and my studio manager, who is like my righthand man. 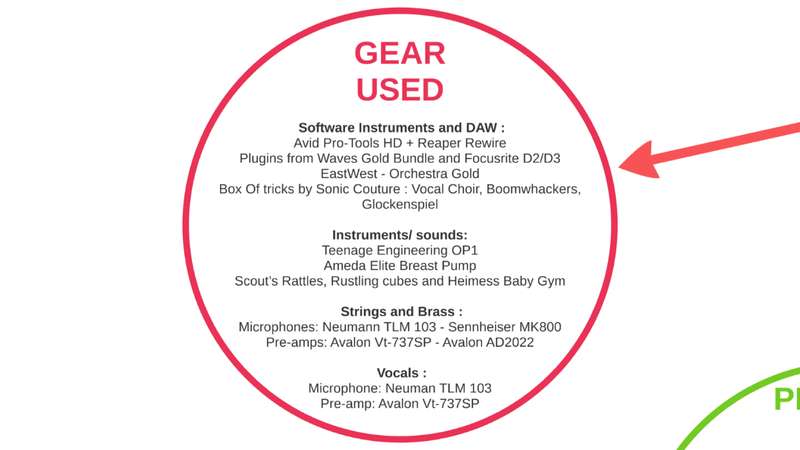 The gear that I used… Anytime anybody finds out what kind of gear I used, any one of these brands find out, they send me more gear, which is great. 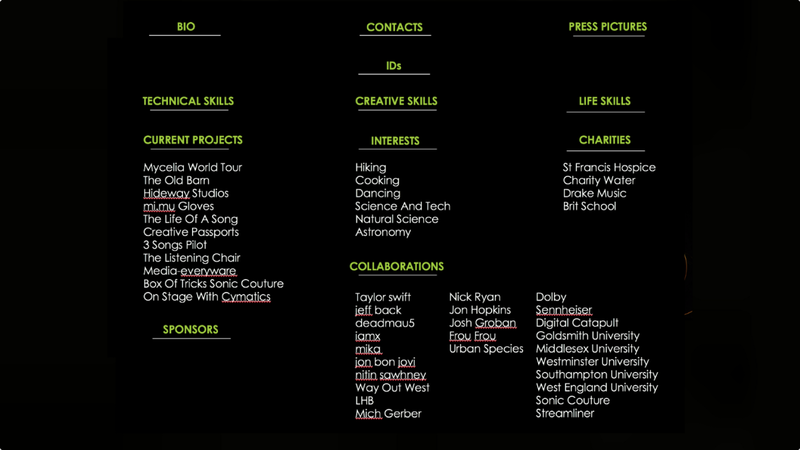 It’s really, really useful to get more sponsorship and develop collaborations that makes sense in terms of branding and things. 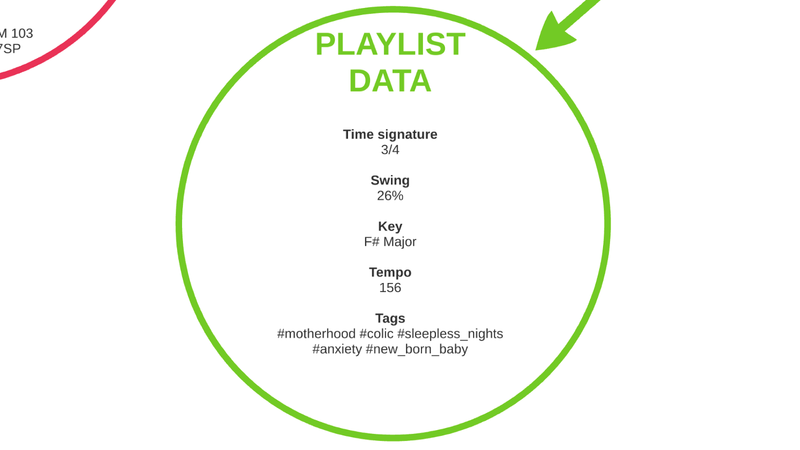 Playlist data: just simply putting the key, the tempo, and things that aren’t like like pop, rock, reggae, but maybe things like motherhood, colic, sleepless nights, anxiety, newborn baby. 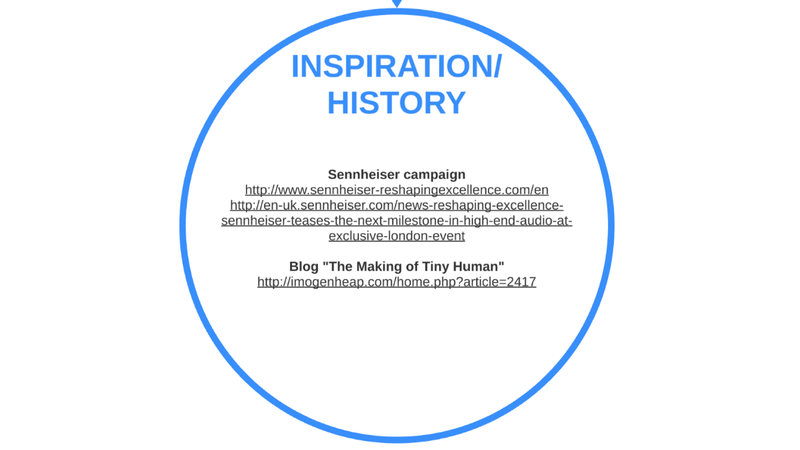 The inspiration, why I wrote the song in the first place: it was commissioned by Sennheiser, but it was entirely about my newborn baby, how I wrote the song, etc. 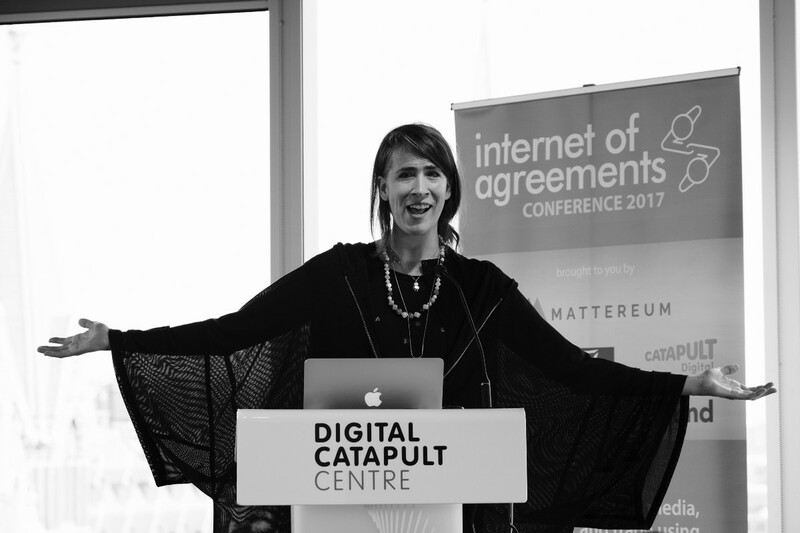 Incidentally, this woman here, Zoe Keating, she’s where I first heard the word “blockchain”. She is a musician, a very dear friend, just about to go to the Blockchain Summit on Necker Island as an “entertainer”. A very bright woman, and is kind of charging ahead in the US as well, doing great things there. Related audio, related video support, and then stems, so if anybody wants to remix, they can have all the stems. 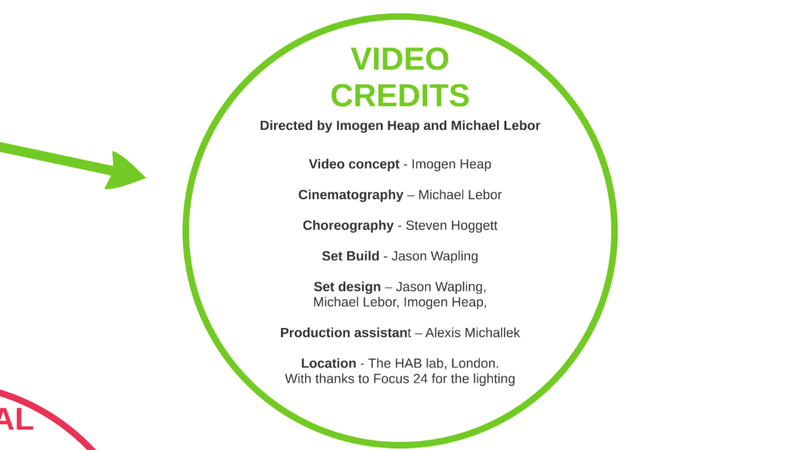 Then there’s things like video credits… And none of this information is anywhere online, but every single song has all this data. Who choreographed the video, who’s the cinematographer, etc. 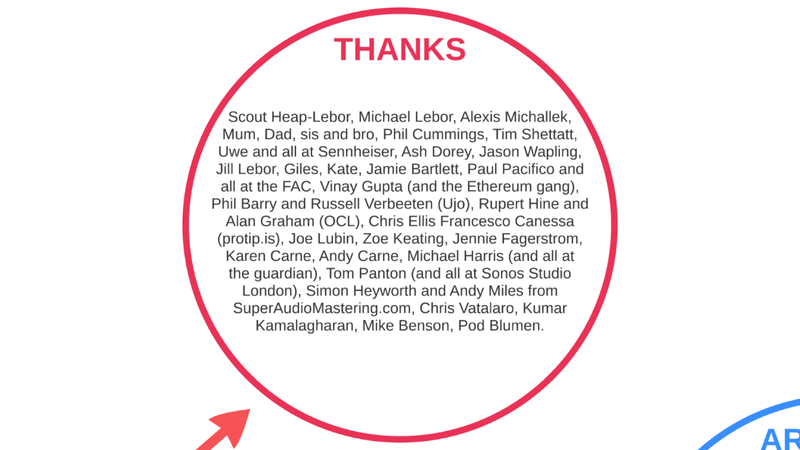 Artwork credits, thanks… All these people, and all of the names of these people have other worlds around them, and if we could knit these together, we could create something quite extraordinary. 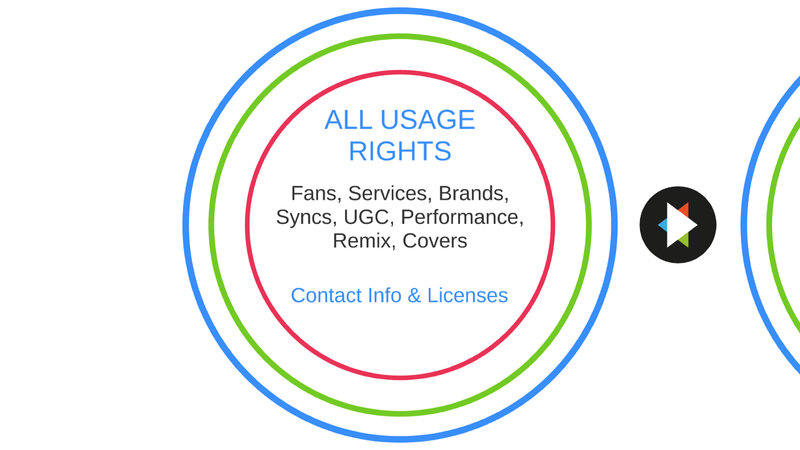 All usage rights. It’s so frustrating to have a record out there and get endless emails about “Can I put thing into my wedding video? Can I remix this?” or “I have remixed it, I sampled it,” and then trying to backtrack and figure out percentages and all that stuff later. And just contact info and license data. What would fans do, what could services do with this data, what can brands do with this data, what can people do who want to use it in a film… What can fans do if they want to put up some user-generated content? Because at the moment it’s really, really difficult to do business with songs. There’s no database of songs to show you how to do things. So people just do things because they want to do things; and they haven’t got time and money to go and find out how to get permission to use the thing, so they just use it. Most times people just use it and they don’t tell us, because they’re afraid that we might say no, but actually 99.999% of the time I say yes, because I want people to make other babies with my music, collaborate and do remixes and whatever. 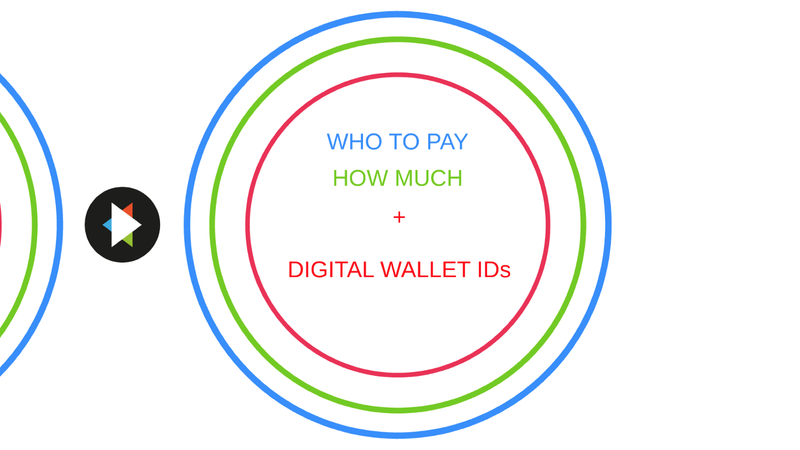 And in this I want to be able to say who to pay, so how much is that violinist going to get, how much might that engineer get, the producer, however you want to divide it up, and what their digital wallet ID is. Because at the moment this is the situation, how you receive money, and it can sometimes take 2–3 years for the money to come, especially if it’s international money, you’ve got all these people in the middle. Say you’re a streaming company. First of all, you send all the songs to the performing rights society, then the performing rights society goes, “Okay, those are our songs, we’d like you to give us money on those songs, please,” and then they go, “Okay,” and then they pay money. So it happens three times, there’s no central place to just acknowledge who owns what and who has the permissions to do what, and this is just in the UK. So each streaming company has to literally pay 200 organisations for one artist around the world. That’s crazy. 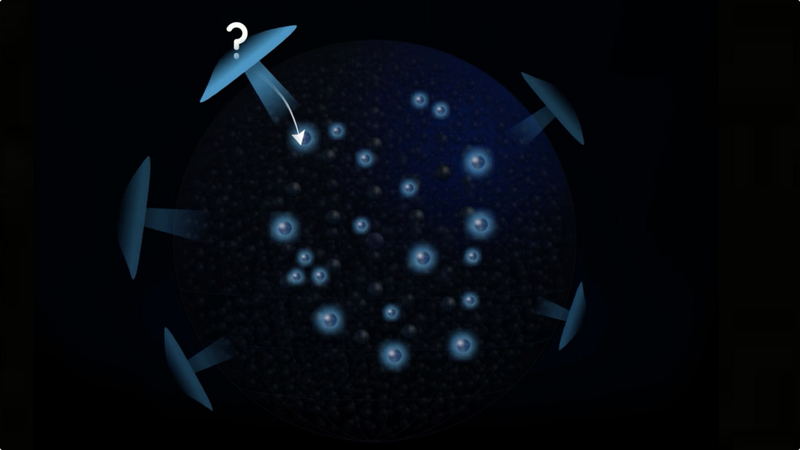 Why don’t we just have one connected database? There we go, there’s all kinds of other things that I’d like to change in the process, but I won’t go into that because that’s too long. Imagine that song, what I call a spore. 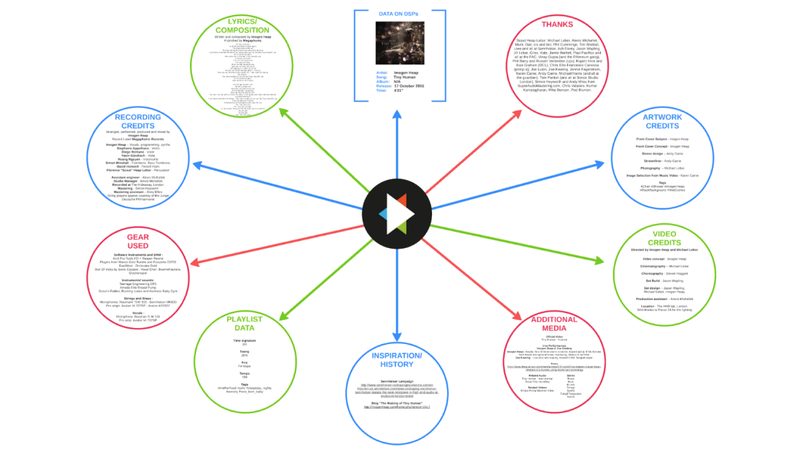 This is the spore of the song, it has all this data in it, all the licensing information, all the musicians, all that stuff from the past and more, tagged and all kinds of things, linked to all the musicians… That one song. Wouldn’t that be amazing, to have that? Then think about how, as an artist, somebody might want to be able to interact with that. 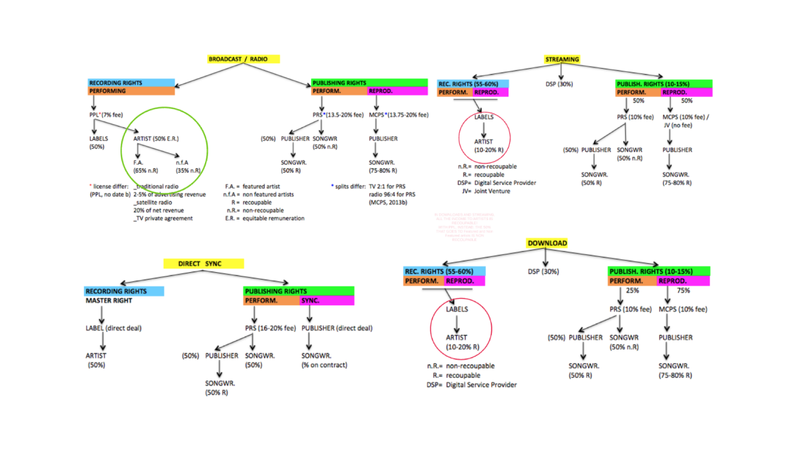 I would like to have things like number of streams, maybe the regions or countries they’re in, and roughly the age group could be useful, to help… Services get this data anyway, so if they could pass that on… The data used, whether they liked the song, how much was received… Then you can really start to know where and what to invest in in the future as an artist, as an entrepreneur. Because at the moment nobody will touch you if they want to invest in you, because all of the intermediaries make it very, very hard for an artist to know where in the world your song is played, how many times it was played who your champions are… You don’t know that. So if you want to invest outside of the music industry, you don’t put any money in, because you don’t know whether the money is going to come back. 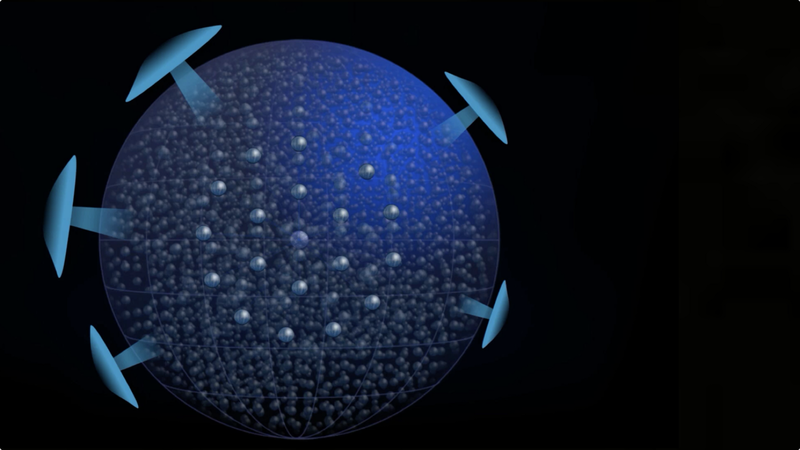 But when you clean up the value chain, then fans could become your investors or patrons. It really starts to ease up the labels too, because at the moment they have to pay these large amounts of money upfront. Now imagine all of my songs, there’s maybe 150 of them, and then attached to that what I call the Creative Passport. Anytime my work or my name is mentioned in a song, it can link you back to the Creative Passport. 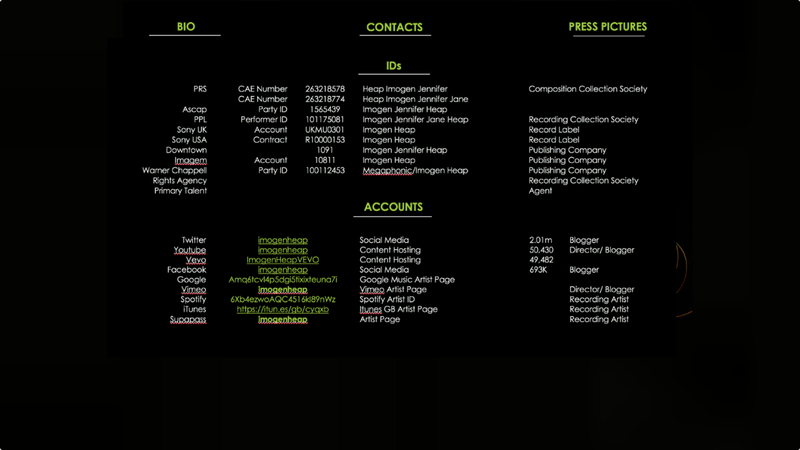 This is the creator’s database, and in here is my biography, my tour dates, my quotes, the brands that I work with, the ethos, charity alignment, all that kind of stuff, what musicians actually inspire me rather than what iTunes thinks inspires me, what are my interests… All this data could be really useful for a brand wanting to find an artist to do some work for, or somebody wanting to put together a festival with artists who are like-minded or share the same team. So now imagine all of the artists on the planet and all of the songs on the planet… This is what I call mycelia, this is like the connective tissue for what’s above ground, which are the services, like the iTunes and the labels and all those people: these are the services, these are the mushrooms or the trees, bear with me, and then underground is the mycelium. Because actually in the real world, the largest organism on the planet are called mycelium, they stretch 10–20 kilometres wide, and they’re what are beneath the canopies of trees of the rainforest, they’re the tissue that connects them together, they share data. I think that’s a great metaphor for what the music industry could be: healthy, sustainable, flourishing ecosystems sharing data to the industry above the ground. I’ve kind of given you an idea, but one of them would be a brand wanting to find the next Corona advert, so they might discover that X band or X artist over there and this person over here, who maybe you’ve never heard of and they might have never released anything that we’ve heard, but you can search this database and maybe you would pay a service… It’s like a business-to-business: the business would pay the Creative Passport’s service to search through this database, to give somebody who wants to find a new song or a new artist for their brand and then search this database, and that database would then pay five tokens perhaps to the artist who generated the data that they’ve used, so it comes back into the ecosystem rather than stays in the services. 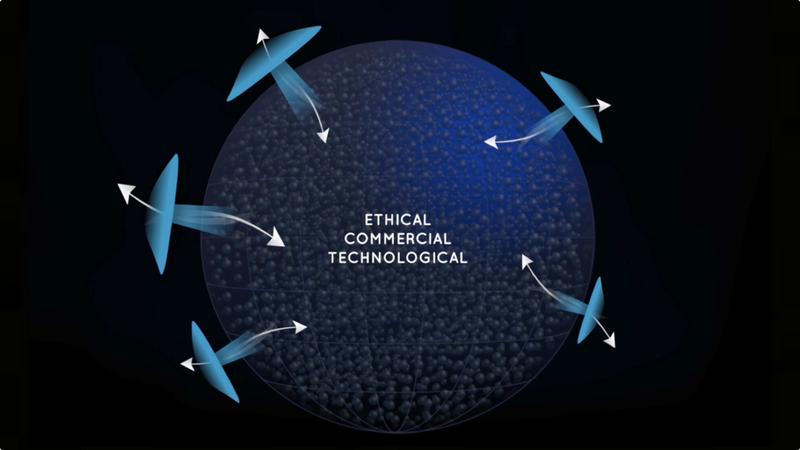 How do we get that ethical, commercial, technical standards… I was trying to think maybe we could get the industry behind this, and then I realised that was an impossibility. So we came up with this concept of Creative Passports, because that’s what we could do, that’s the bit that the artists could do, we could generate the data that currently doesn’t exist. 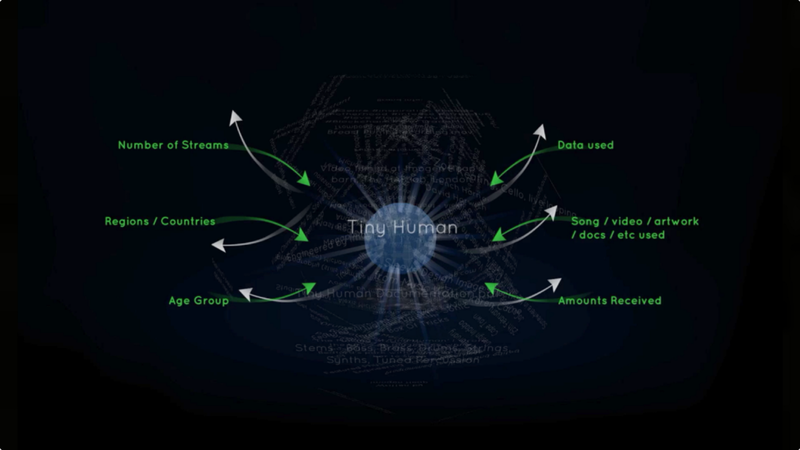 When, and I know it’s going to happen, when an open global music database does emerge from the ashes, then we can link into it and we can author into that too via our Creative Passports, and connect to the existing organisation, enabling us to work with legacy works, but also enable us to bring in other revenue outside of just streaming. 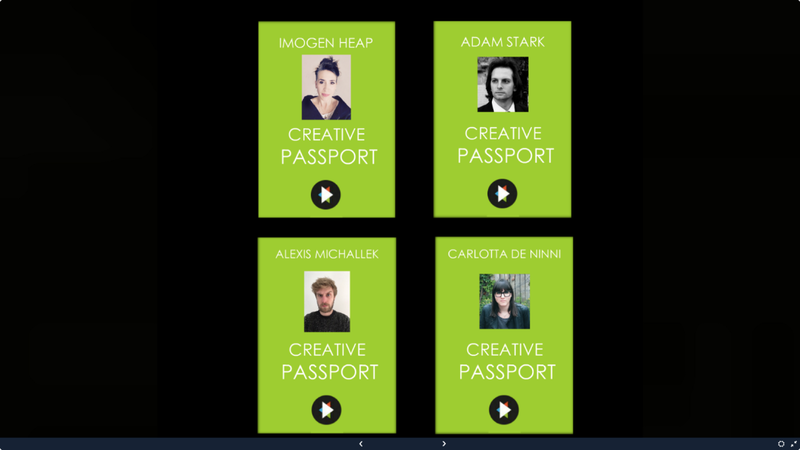 There we go, Creative Passport: there’s my biography, contacts and press images, all the ids of all the organisations, so you’d literally be able to connect up to that, you would see them highlighted on my Creative Passport so it’s good promotion for them too. 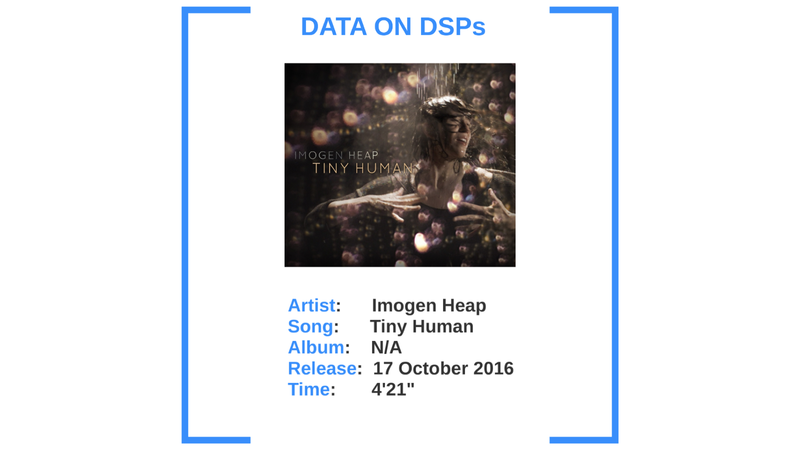 If you’re a new artist, you might go to my Creative Passport and go, “I wonder what Imogen Heap does with her database?” and then you would see all this data, and you’d be able to tick the boxes that I ticked and have a similar service. Accounts, all that good stuff… All my skills, if somebody is looking for some specific skills… It basically enables anyone that’s not known to the world to have a look into getting a job maybe as a guitarist, because they’ve realised they were just down the road and they’ve had some pretty good reviews, I’ve never heard of them but they’ve had some good reviews on this service… So it’s kind of like a marketplace too. Because I imagine, in the event of a natural disaster, as an artist, to be able to generate money so that any time somebody was playing my music, to be able to on that day go, “Okay, this is something I care about, this is a country that I’ve been to, I really care about the people, and all of my money from all of my songs on this day I want to go to this disaster relief fund,” and to be able to have some way to visualise that, so that you’re reaching out to your fanbase, to anyone that’s listening to your music and spreading… like an umbilical cord to your songs, so that it doesn’t just stop the relationship. When you release your song, currently you just release a song and off it goes and you’ve got no idea what happens to it really, different organisations trying to get money from it if they’ve got their data correct, and it’s a very distant relationship we have. But if there’s a way that this song is always linked and always receiving information to and from, then we could start to really speak out and reach out and share, and hopefully rather than somebody putting together a really expensive concert that cost a million pounds to put together that could have gone to a disaster relief fund, we just make it really easy for people to donate. There we go — that’s what I wanted to talk about. 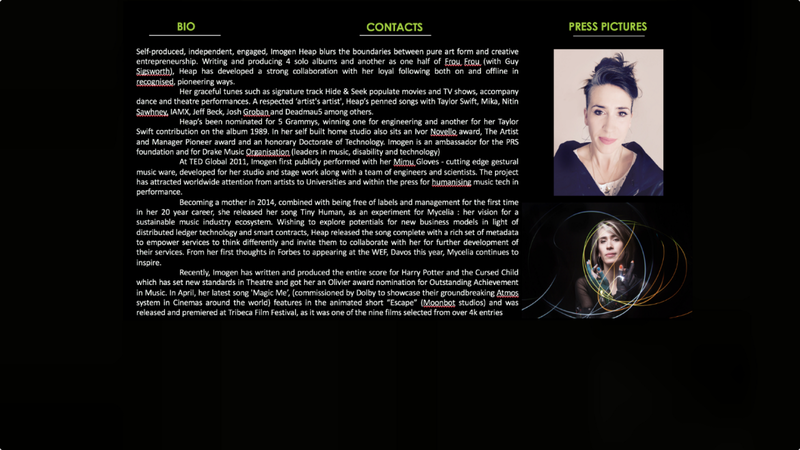 You can download Imogen’s Creative Passport here.